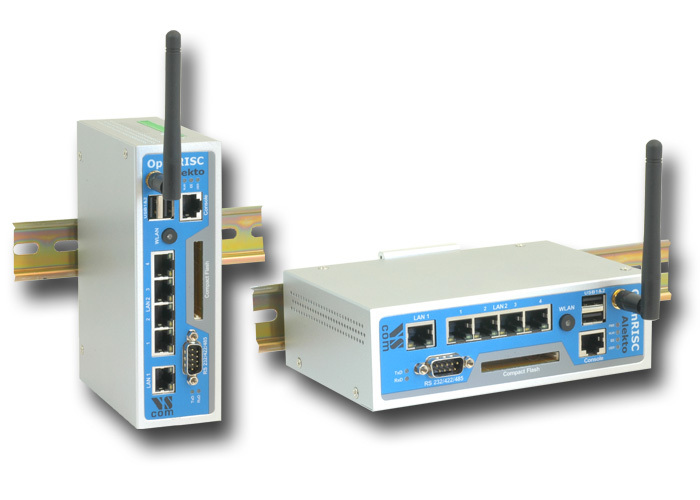 Vision Systems GmbH released ARM 9 RISC industrial router, OnRISC Alekto LAN. September 1, 2010 - Vision Systems GmbH - Industrial PC provider, announces the release of an upgraded ARM 9 RISC embedded industrial computer - OnRISC Alekto LAN with 2 Ethernet ports and an integrated Ethernet Switch. This model is a further member of the OnRISC family. Like the initial Alekto it is based on an ARM9 RISC CPU and runs the full-featured Debian GNU/Linux operating system, now with Kernel 2.6.35. To learn more about the OnRISC family, please check out the older news announcements (and here). Further the product pages provide much information. As with all the Alekto and Alena models Debian GNU/Linux is available as operating system. Vision Systems provides a sample installation of this operating system, an image prepared for a Compact Flash or microSD card. This software also operates without changes on the Alekto LAN, as do existing customer applications for Alekto. So Alekto LAN is suitable to cover the same control and networking applications for industrial control, transportation systems, environmental monitoring and small office servers. However the second Ethernet interface is internally connected to an embedded Ethernet switching hub. So Alekto LAN is predestined for more special networking tasks. It can span a small local network, while the first port provides as an uplink to data servers or the company network in general. The special networking capabilities make the Alekto LAN a good base for a Router implementation. Vision Systems decided for OpenWrt as the software to make the Alekto LAN a Router. OpenWrt is not only a Router software, in fact it is a complete system for users to build their own Router firmware. To do this there is the base system and a collection of packages to install. Vision Systems added support of Alekto to OpenWrt. Usually OpenWrt is installed by end users onto the Flash memory of their SOHO Routers. That capacity is limited, typically to 8 MB or less. But on Alekto LAN the software is installed on mass storage, where practically no size limit exists. So users are free to add as many packages as they like or need. Vision Systems selected several of the the OpenWrt system packages to prepare an installation. The result is available as a complete image on the DVD. Users can write it to a CF card, boot it and use it. System developers may use it as a starting point for their own software, which they distribute with Alekto LAN. OpenWrt supports a WLM54G MiniPCI network adapter (based on Atheros AR2413). Placed in the internal slot Alekto LAN can operate as an Access Point to span a WLAN radio network for clients. It is also possible to use WLAN to connect Alekto LAN to other networks. As all the other brother models Alekto LAN supports 8 signals for Digital-I/O function. This implementation of OpenWrt provides a web-based user interface to control the direction of the signals, define the output and read the input. There is also a direct TCP interface to use this function from client software. The implementation allows to add external mass storage (e.g. HDD), making Alekto LAN operating as a NAS. All types of USB devices may be used, provided there is support for them in OpenWrt. for printers connected to USB or even the serial port. OpenVPN is a free and open source software, providing encrypted Virtual Private Network functions over any network based on IP. The Server component allows to establish a secure encrypted connection from a Client PC to Alekto LAN. This is especially possible from the Internet, virtually connecting the Client to the internal LAN. Operating as a Client securely connects Alekto LAN to a central server. This way computers in a branch office get secure access to the headquarters network, without purchasing a dedicated line. Dynamic DNS services provide an easy name to stations using an Internet connection with periodically changing IP address. OpenWrt supports several free (for private users) services, to automatically update the DDNS information, when the public IP address has changed. There is a good chance to support a new service by updating the scripts in OpenWrt. The OpenWrt implementation provides a proxy server for clients on the LAN side. OpenWrt also supports UPnP, this enables clients to access the configuration of the Router. In particular certain software on the clients can make its network service available to the Internet, by defining a special tunnel to forward the external traffic to the client. Encrypted access to the command line of OpenWrt. May be used for certain configuration, or just monitoring the operation. Since OpenWrt transports the IP traffic from and to the Clients, it can also monitor the content. Doing this it attempts to protect the clients from certain types of malicious packages. OpenWrt provides features to set priority to certain types of traffic. This will help some applications to perform better. 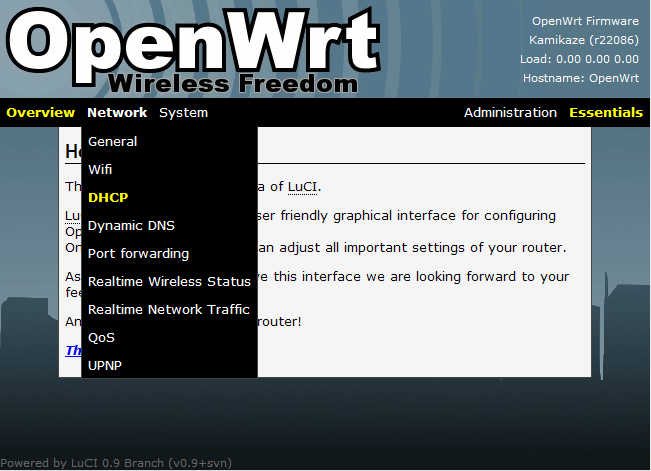 For the LAN (and WLAN) clients OpenWrt operates as a DHCP server. Clients get a correct IP address for the network, and also other configuration information to get access to the Internet. For WAN access OpenWrt can request and receive a suitable configuration of the public interface. This function is often required for an ISP based on TV cable services, but of course not restricted to this. OpenWrt provides information to the Administrator, so he can check the type of traffic occurring from and to the Internet. This will help to tune the configuration for better performance.